Word from the grapevine is that Sylantro has been acquired by Broadsoft. 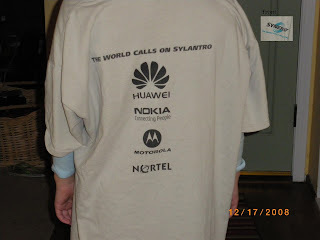 Sylantro was a great company to work for during the time I was there. We had great engineering and a great product to work on. I really liked the work I was doing there but could see the end was near for me. I worked with many great people and hope the few remaining folks I know that are still there do well in whatever comes their way. About a year and a half ago, just after leaving Sylantro, I wrote my own analysis of Sylantro and their market. At the time I could not see the market sustaining two competitors or either of the companies changing enough to branch into new markets. My opinion was that they needed to merge to survive. Maybe I was not so far off. While working there, I expected Sylantro to be the dominant company in that market. Unfortunately there was a series of management blunders that really derailed Sylantro. Pete is a great guy and a great visionary. I am sorry to see his company fall. Hopefully Broadsoft treats the remaining folks well and they manage to have success. When I left, I had the option to but a bunch of shares. As I considered it, I happened to meet a very successful investor. His advise to me was to only invest, whether it be $1 or a million bucks, if you think you are going to make money. I had no illusions that Sylantro would never be public or be acquired for enough money that I my stock would have any value. I chose to let the offer expire. Friends tell me that not only was the acquisition material received past the deadline, but their shares are worthless anyway. I seems this was a hush and rush job. I am glad I got some good advice at the right time. Goodbye Sylantro, we had fun and did some great things. Broadsoft is buying Sylantro. Most Sylantro stockholders are getting nothing. It's a fire sale. In the due course of time I'm sure someone will announce the merger/fire sale. Not sure what the secrecy is about. >> Unfortunately there was a series of management blunders that really derailed Sylantro. -- Outsourcing R&D to Bangalore during the downturn tops the list. It killed the initiative of a bunch of really committed people and encouraged palace intrigue and distrust. There were a few management blunders. The marketing and management decisions that took it's toll. Can you say IDC and InterTel. I heard a number yesterday but it is so unbelievable I can't post it. I have told a couple ex-Sylantro friends just to see their reaction. So far, no one has shared a copy of their stock packet with me though. Too bad. I'd to scan it and post it. And I did not even receive all the material. They did not include the carve-out list. The carve-out list, I'm assuming, is for the execs to still have their common stock be worth something. I added a picture of the forbidden t-shirt. I have no recollection of why we were not supposed to wear it out of the office. In reply to the emails, sorry, I am not gonna mention the amount I heard. The source is too unreliable, even for me. BrostSoft and Sylantro are more or less same kind of company, have same portfolio, profile, target market, whether BroadSoft will have same destiny as Sylantro soon? Maybe, who knows. Nice T-Shirt... I am sure you have your "I switched to Sylantro" one? Yeah, what I heard is appalling to the point that I wonder if just shutting the doors would have made more sense! - Company valued at $0. - Outgoing CEO took home a majority share of the carve-out. No wonder exhibit E was missing? - All existing Sylantro employees laid off or given 1-3 month notices. Incoming management clearly indicated California offices will be shut down. Mood is funereal at this once vibrant office. MSO currently using synergy-4.2, I am wondering how this buyout will affect me and my customers. Could Sylantro experts comment on my concern? I am no longer an expert but since I believe they were running out of money, the merger will likely allow them to continue to support existing customers. The new company will likely migrate users to one platform or the other over time. If I were a customer I would not worry too much in the near term but would not expect any new features on the platform. I would only hope there was someone to support me for service affecting issues. and very innovative product could end with valuation of 0$. Bangalore center definitely had a lot lot of value , it helped Sylantro survive till now. That could probably be the only asset Broadsoft could materialize out of this deal. I don't think that the forbidden tshirt really deserves that title. The sales team under the leadership of Marco is commendable for their work in bringing BT so close to accepting the deal. If only it were matched with the quality levels demanded by BT, today Sylantro would have been busy figuring out dates for going IPO. There was always that one customer who would make the difference for Sylantro. There was SBC, AT&T, BellSouth, Sprint, Alcatel, Siemens, Nokie, Huawei, Motorola, Nortel, Intertel, Korea Telecom, Bell Canada, Swisscom, Telus, Telia, Rogers, Time Warner, Covad, BT and the list goes on. We realized that it just was not going to happen. Either Sylantro did it wrong or there was never real money to be made form those customers. I always viewed Marco as the one who was brought in to shut the company down. He did many things I did not agree with. Being a peon, all I could do was leave and so I did as did nearly all the talented engineers. Makes sense than later releases had issues. There were some good engineers in India but the best stopped being engineers long before. Well, I do not have deep insights into the corporate dynamics at HQ, but watching from IDC I can say that, with respect to BT deal, Marco has done all he could using his clout in the telecom circles to get the BT folks to explore the advantages(and dis-) of integrating Synergy into their network infrastructure. Even they had to spend a lot of their resources for all the lab testing for more than a year. Clearly, there was no lack of will on both sides for this alliance. I remember Marco even making a statement during his bangalore visit like "all we can do is to get the deals and the customers to the table but ultimately the customer satisfaction lies in your hands.. all you guys here in bangalore". Quality of the amazing 4.0 release could not be broken in a matter of few months. It was indeed a work of some very skillful software system artisans and remained a pretty solid product until two years back. But, over the release cycles of 4.1.1, 4.2 and 4.3 it was vandalised to quite a percievable extent till the point that the deals(including the existing customers) began to depend solely on the consistent behaviour of the individual features in the rickety 4.3 structure. You may be aware before you left, that according to the original Synergy roadmap, development for release 5.0 was to take-off in December '07. But, due to BT's concerns over meeting the technical benchmarks, 5.0 was defered indefinitely and thus took birth, the release 4.3. The Synergy 4.3 was a BT specific release tailored to meet BT's needs & requirements. This is where BT was different from other big boys like AT&T. Sylantro put all its eggs in the BT basket. BT was probably skeptical about the quality and just played the wait and watch game to avoid burning its own fingers. The *abrupt* exit of the feature prime of SSR(which was one of the core requirements), inspite of been offered promotion to a manager prosition, didn't help either. Meanwhile, in the dark, Ribbit came along and winked at BT and rest, as they say is history. One thing I agree with you is that probably Marco had overestimated IDC bangalore. Obviously, he was no geek like Pete Bonee with stanford and MIT degrees. I hope Broadsoft successfully carries the mantle of IP Centrex forward. Please be advised that BroadSoft must always be written using a capital 'B' and a capital 'S'. The only smart thing one could do now is get off either platform and go with a company with a proven track record of growth and stability... Metaswitch. So the deal is done and I talked to a few share holders who are now dissenting shareholder due to the fact the paperwork arrived the day of or after the due date. Seems they might get some cash for their shares. I think it was .001 cents a share. So, I guess 10 bucks is not bad for your 10,000 shares. I knew I should have bought 1 share just to make them go through all the paperwork. Hosted systems will never win over enterprise systems. They are good for 10 or 15 person shops who can live with outages. Guys , please suggest if joining Sylantro, now called Broadsoft is a dumb/ok idea?? Marco was the final nail in the coffin for Sylantro. He was only concerned with making the company appear to look good, i.e. window dressing rather than actually make solid business decisions. He also has no understanding of how to sell into the carrier space and his mentality is the reason that deals would fall though when he got involved. You have to look at the revenues, they started to fall as soon as he took over. If anyone hires him as a CEO, I’ll sit back and enjoy watching the pending disaster.